Wishing you had a rainy day fund available when life rains down those unexpected emergencies – a car repair, that extra bill from the dentist, a household appliance breakdown? CNBC reports that only 39 percent of Americans have enough savings to cover a $1,000 emergency. Are you one of the majority 61 percent? How is it possible to save money, when it feels like bills and necessities are sucking up your entire paycheck? The first step is knowing where every penny of your paycheck is being spent. The best way to determine this is by writing everything down. Not just the big ticket items like rent or groceries, but everything. Spend $15 on a movie at the theatre? Write it down. Spend $1.25 on a soda at work? Write it down. For a whole month, keep track of where every dollar from your paycheck goes, and then you’ll be able to decide where changes can be made. You might be surprised by how much you spend on things that aren’t essential and could easily be cut back. I was amazed at how many little non-essential expenses I had that added up to a whole lot more than I thought at the end of the month. There are plenty of online budgeting apps to help with keeping track of your monthly expenses, and most are free. Quicken Budget Calendar, Mint, and Trackeverycoin are a few free online apps, but keep looking until you find something that works for you. Even a simple spreadsheet can help you keep track. Once you’ve identified where your money is going each month, then you can decide where you’d really like it to go. It will be much easier to see how much you actually spend paying bills, eating out, buying clothes, or grabbing coffee, and you’ll be better able to identify your personal priorities vs. the things you can do without. Once you know what your essential items are (rent/mortgage, utilities, any loan payments, etc.) you’ll be ready to take the next step. You’ve heard the phrase “pay yourself first”? One of the reasons it’s difficult to save is you might be waiting to see if there’s anything left over from your check before paying yourself. Change that around – when you get your check, the first bill to be paid is you. Sock something into savings, not including any savings allotment you are already using to automatically pay one of your bills. This is savings you don’t touch until absolutely necessary, not until that unexpected emergency rears its ugly head. How much do you put away? As much as you can, which is usually more than we think we can. Start with a modest amount each month. If $150 each month is scary at first, try $100, try $30. For those months when it seems that life has intervened and your income is barely covering your regular expenses, try to save at least $5, or even less, just to stay in the habit. If it’s not possible to save anything this month, give yourself a break and pick it up again next month. How often you receive your paycheck can affect how you view your monthly savings. For example, if you decide to save $50 each month and get paid twice a month, that means you can divide that $50 into $25 per pay period. If you get paid once a month, that’s the whole $50 at one time, out of one paycheck. Either way, you’re saving the same amount, it can just feel like more when it comes out all at once. Sometimes I find if I consider each paycheck as actually less income than it is – maybe $25 less – I don’t miss it as much, and it’s less stressful to tuck some into savings. One way to do this is to set up a savings allotment right from your paycheck, so the money goes directly to your savings account. If you save $150 a month, it will take a little over six months to have $1000 ready for the next unwelcome surprise. The important thing is to put whatever amount you decide in a savings that is only accessed for emergencies. That new coat, or latest iPhone upgrade is so tempting, but you actually have a perfectly functional coat (even though it’s a few years old), and the technology on your current phone is likely more than sufficient. Identifying needs vs. wants is an essential part of being able to save each month. It’s difficult to pass up an indulgence, but after all the essential expenses are covered, and your emergency savings has been fed, you can look at allocating other funds. If you’ve consistently saved for emergencies and paid the bills, and still have a little left over, maybe it’s time to treat yourself to one of those small luxuries you want, or maybe you want to continue to pass up the small treats in order to keep saving for something bigger later. 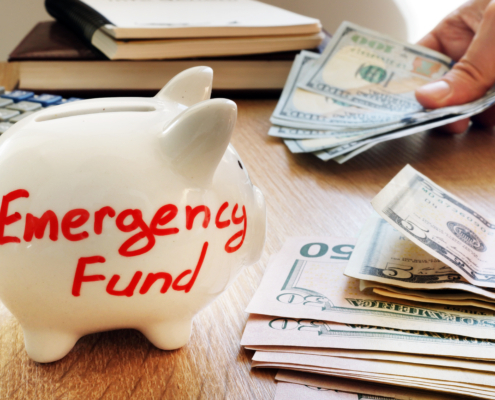 As long as you keep your rainy day funds separate from anything set aside to use for fun, you’ll be in the best position to confidently handle any emergency. Saving is a lifelong commitment, not just for one month. Make this a life-changing event. The habit of saving is one of the healthiest habits to develop. Losing the stress of worrying whether you’ll be able to pay for the next car repair is a healthy move. Choose to make saving money a priority each month, and you’re choosing to make YOU a priority. There will always be unexpected financial surprises that creep up just when you think you have a handle on your budget. Your rainy day savings is for just that purpose, so you can take care of yourself and your family, minus the stress. Let it rain, you got this with your financial umbrella. Stay tuned for more specific tips on where and how you can painlessly cut some of your monthly expenses.